As we wondered through the streets of Aspen, Co, we were in search of a great place for dinner. On the corner of E Hopkins Avenue and S Mill Street, down some stairs, is a hidden gem: Creperie du Village. Initially, we had no idea what we were in for. It took us quite a while to decide to have dinner here. We must have walked by the place about four times. We even walked inside and spoke to the host twice before we made our decision. They were able to squeeze us in at a two person table for dinner, but they were so booked that the host said he would need the table by 8. This gave us an hour and a half for dinner, which was more than enough time. The restaurant seats maybe 40 people including the bar space, which ensured that our food came out fairly quickly. The small space added to the cozy and intimate ambiance of the dining experience. It feels as though you have been transported from a ski town to a quaint Creperie in France. The front of the restaurant had about three tables to seat parties outside, but it was a bit cold for us that evening to eat outdoors. 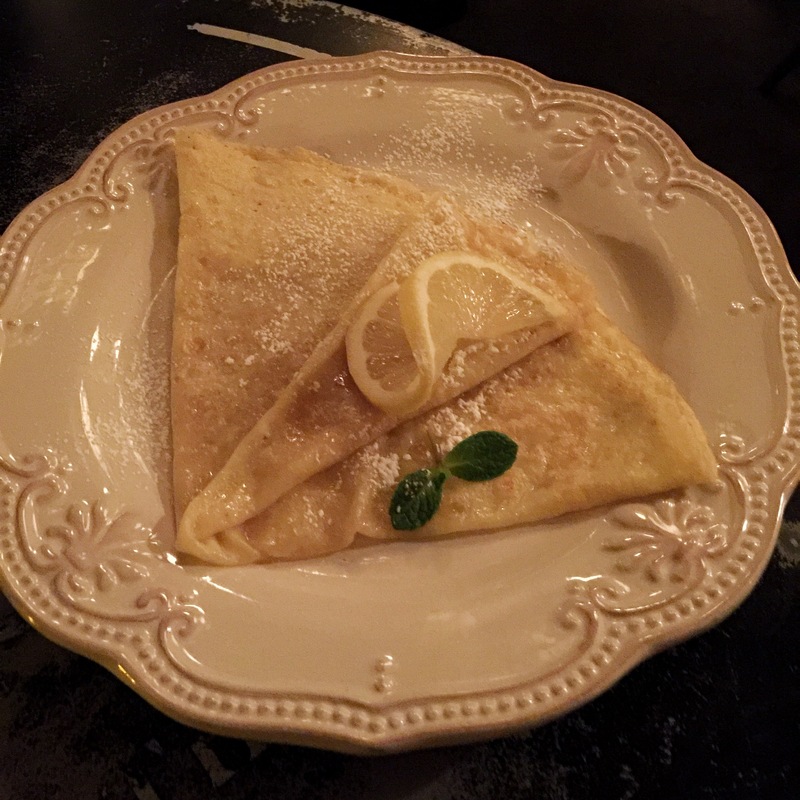 The food was so incredibly good that we returned to Creperie du Village THREE nights in a row!!! We had to go back and eat our way through the menu! If that doesn’t scream “GO HERE IF YOU ARE IN ASPEN,” I’m not sure what else does! Our first evening we had the chèvre and roasted beets, and ordered the Pure Love crepe for dessert. 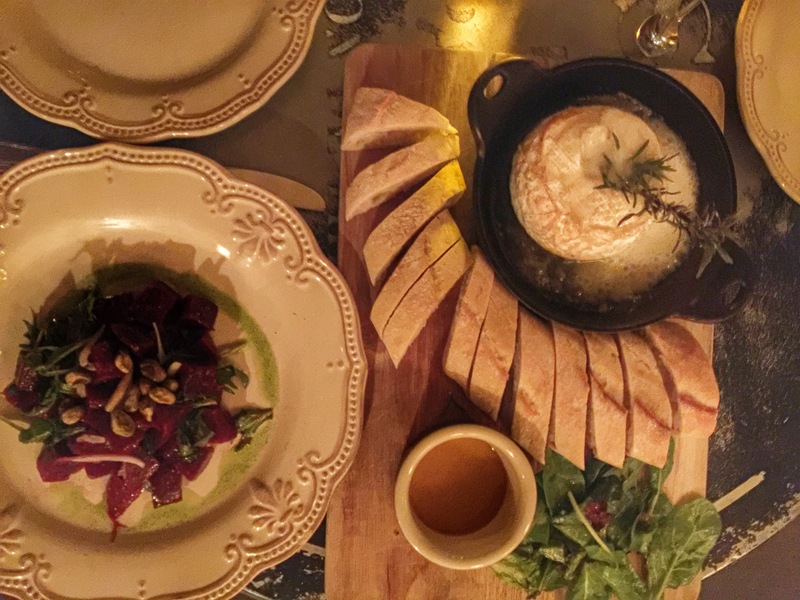 The chèvre is goat cheese that is baked in a cast iron skillet with rosemary, served with a very light truffle honey and fresh baguette. It is absolutely divine! The warm goat cheese has such a depth of flavor, which is enhanced with the truffle honey. Emily is not a huge fan of mushrooms and she even felt that the truffle honey was the perfect pairing with this dish. We loved the baguette with the chèvre, but we also dipped some of our roasted beets in it as well. The roasted beets are served room temperature with house-preserved lemons, arugula and pistachios. It is great to share as a side dish to accompany many of the other menu items. These two dishes were enough for us for dinner, since we had a very large, late lunch. To finish we had the Pure Love crepe, which is one of my favorite styles for a crepe: a light, warm, freshly made crepe that is dressed with melted butter, a squeeze of lemon and a dusting of cane sugar, garnished with a lemon slice and some fresh mint. You can’t get more refreshing that that. This meal was perfection and the first thing we did was try to get a reservation for the next day. Unfortunately, they book up very very fast, so if you are planning a trip to aspen, make your reservation now! Talk to David or Raphael and let them know that Jessica and Emily from Chasin’ Cravings sent you. Although they were not able to accommodate us for reservations, we still attempted to have dinner there the next evening. To our surprise, we were able to sit at the bar for dinner, as it is generally first come first serve. The experience at the bar is dramatically different from the rest of the restaurant. The whole kitchen is open behind the bar and you have a front row seat to the show that goes on throughout the evening. It is very exciting to watch chef Andreas Neufeld and his amazing assistants create the extravagant dishes that emerge from this small open kitchen. It is incredible to see how he works with four inductive heat plates, three crepe plates and a two small prep areas. While we sat there in complete awe, we wondered how everyone made it out alive in these close quarters with the fast pace of the kitchen. Every time that something new was being prepared, we would ask what it was and then, most times, order it. At one point, one of the sous chefs put two pieces of salami on the crepe griddle and we asked what it was for. Chef Neufeld’s response was “well it seems someone is grilling salami for no reason!” We all laughed and realized that although this was not a menu item it was definitely a great snack and enjoyed a slice of grilled salami on fresh sliced baguette. 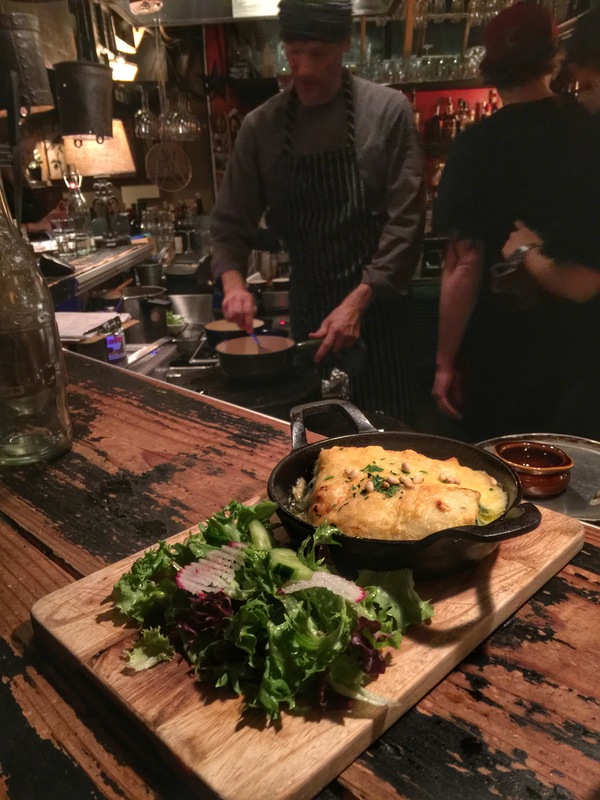 We really enjoyed this meal at the bar and if you are looking for a more laid back experienced, then this is the place to eat. As we watched the dishes being prepared, we ordered a few things to share. 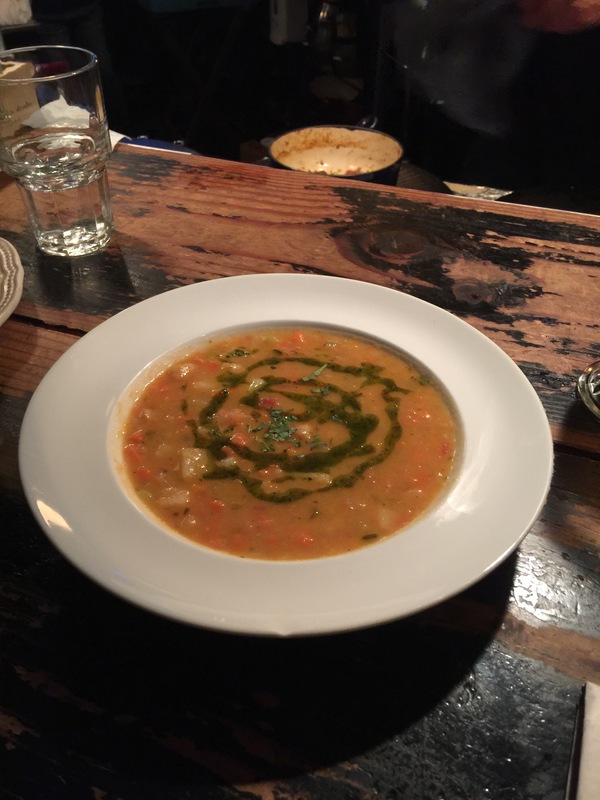 First, we started with La Creation du Moment, or the soup of the day, which was a roasted tomato soup with fresh vegetables. 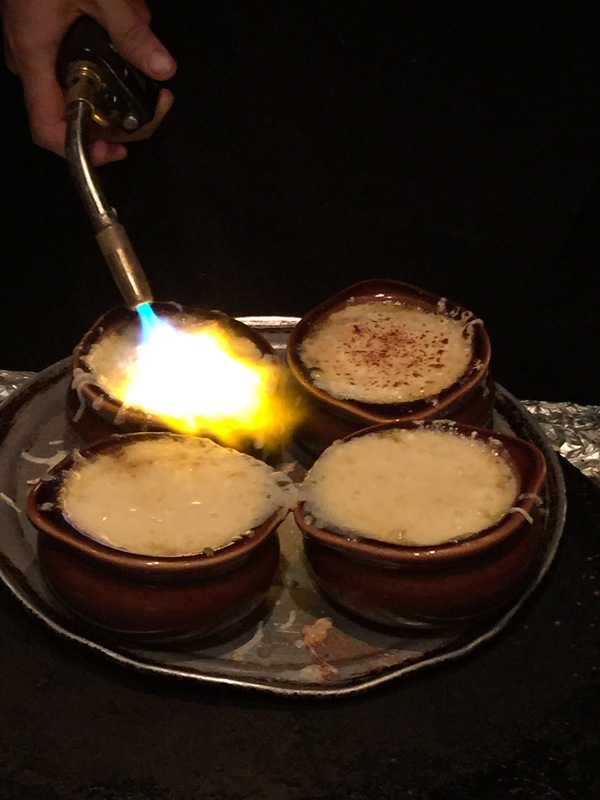 As we enjoyed the soup, the blow torch came out to brown the gruyere on top of the Soupe À L’Oignon, or french onion soup, and we had to try that soup as well. Both soups were fantastic. The roasted tomato had a lot of depth and was very hearty. It was seasoned perfectly and was a great start to the meal. 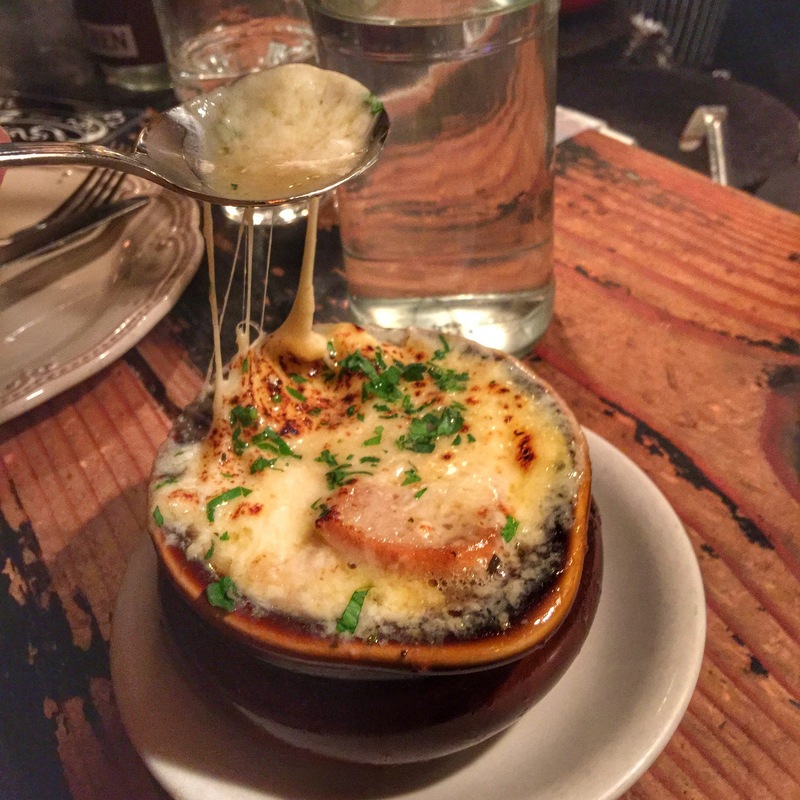 The french onion soup was one of the best that I have ever had. I am very particular about french onion soup because it is very often prepared improperly. I asked Chef Neufeld why it seemed so light in color and he explained that he uses a chicken base rather than a beef base as it provides a lower sodium content and allowed the flavor of the onion to flourish. This was interesting and surprising since there was still so much flavor and richness in the soup. Usually the beef broth provides the depth to the french onion soup, but Chef Neufeld has figured out how to develop the perfect flavor using chicken broth. This also makes the soup a lot lighter, so you are still ready for the next course of the meal without feeling too full from a heavy soup. We followed the soup with the Nirvana crepe. This crepe was so different than anything we had ever had before and we knew we had to try it. 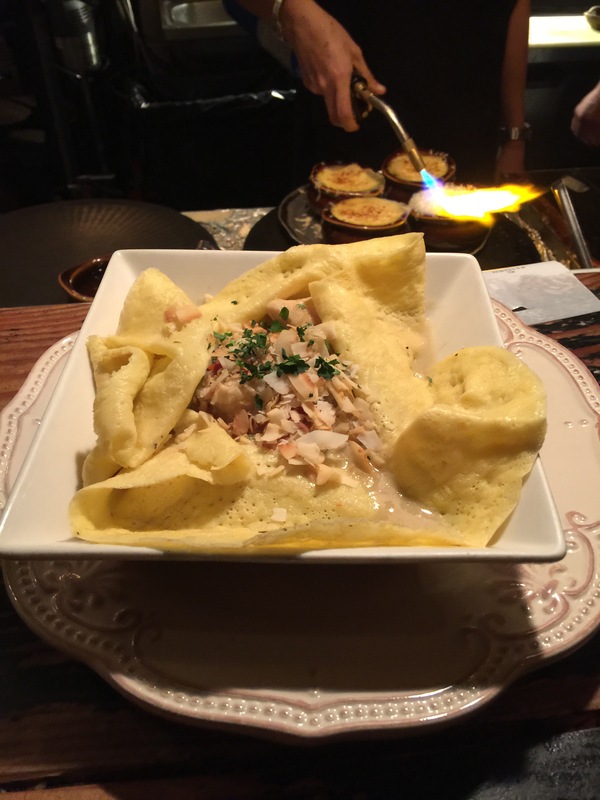 The crepe was draped over a square bowl and filled with Thai green chicken curry and veggies. The addition of fresh basil was a great touch along with eggplant, squash and red peppers. The menu indicates that the dish is a medium spicy, which is true on the american scale, not the thai scale. It is a perfect amount of spice and definitely tolerable for people who enjoy spicy foods. The crepe went really well with the green curry and serves as a great substitute for rice in this dish. I brought some of this home and had it during our lunch break from skiing at Snowmass. I highly recommend trying this dish because it is something that you really won’t find anywhere else. Next we had to try the Spinatpalatchinke, which is a spinach and ricotta filled crepe that is topped with a cream sauce, gruyere and pine nuts and baked in a cast iron skillet until everything becomes a melty gooey goodness. The crepe comes out very hot so definitely wait a few minutes for it to cool down and then, dig in! There is a good serving of spinach stuffed into the crepe, which we were pleasantly surprised by. Every bite you were able to really get a good taste of spinach along with the various cheeses. This was a great and lighter dish to share between two people and still be able to try a few other things on the menu. 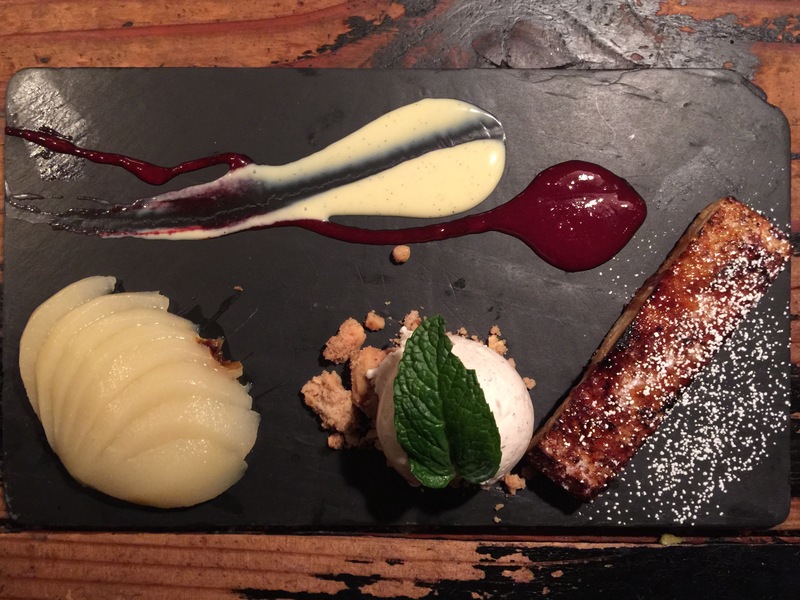 For dessert, we just couldn’t decide between the caramelized bread pudding with white wine poached pear and the crepe called La Dolce Vita, so we got both! They were both really good. The bread pudding was a perfect combination of sweet and crunchy from the caramelization. The poached pear was a fancy and much better version of the canned pears from the supermarket. It was served with a house-made raspberry sauce that was perfection. We were definitely wishing there was more bread pudding by the time we finished this dessert. 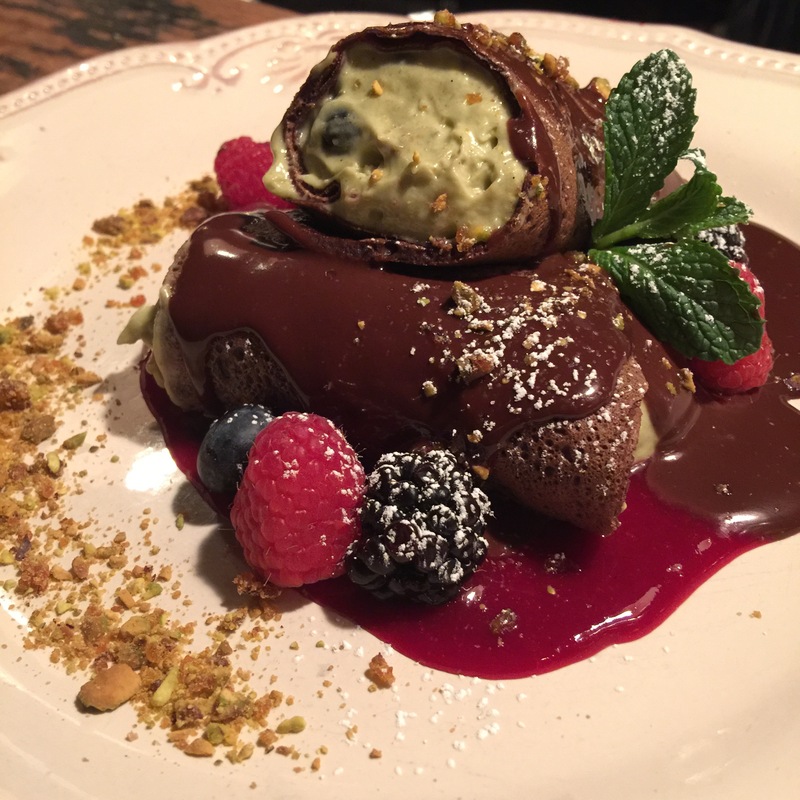 La Dolce Vita was a chocolate crepe that was filled with a pistachio mousse and berries. The mousse was very light and flavorful and was complemented well by the chocolate crepe, chocolate ganache and pistachio praline. Our second meal was a huge success and all we wanted to do was come back for more. Once again, there were no available tables for the following evening, but after a day on the slopes we went back and tried to see if they could squeeze us it. Sure enough, they were able to find a table for us. Our last meal we came back knowing exactly what we wanted to try…the soup of the day, escargots en brioche, sea scallops, green asparagus and some more Pure Love! 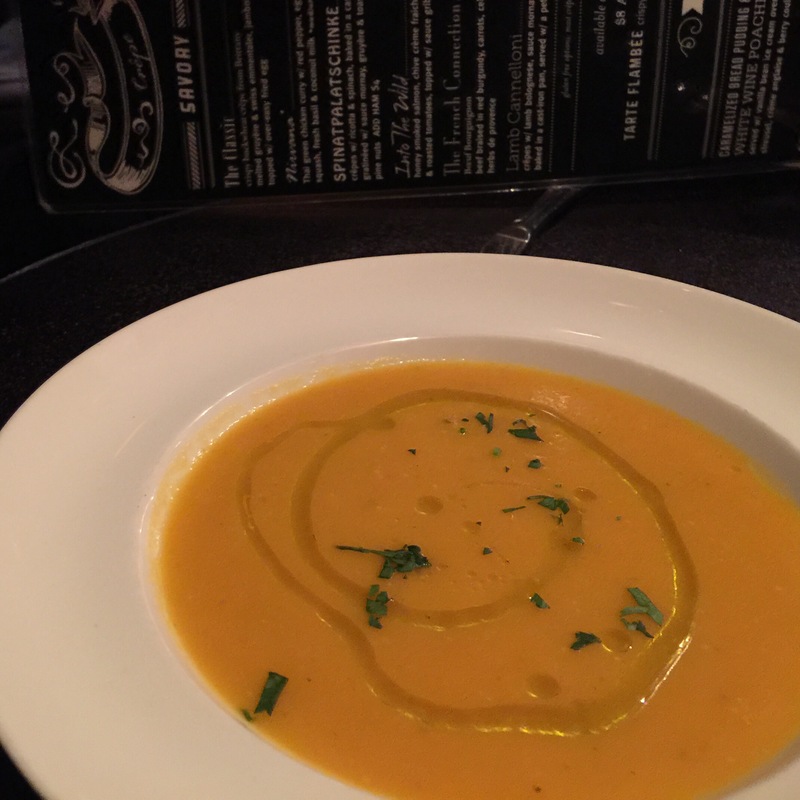 The soup of the day was carrot and potato. It had a creamy texture from the potato but was not very heavy. It was served with a drizzle of olive oil on top and was great with a little bit of fresh ground black pepper. The escargot (OMG THE ESCARGOT!) was prepared in a bit of a non-traditional way, which was very refreshing. The sauce was made with garlic, butter, shallots, tomatoes and pastis, and was incredible. The toasted brioche was lathered in butter and grilled to be crispy and was a great accompaniment. The sauce was so good that once we had finished the escargot and the brioche, we requested an extra basket of bread and wiped the bowl clean! 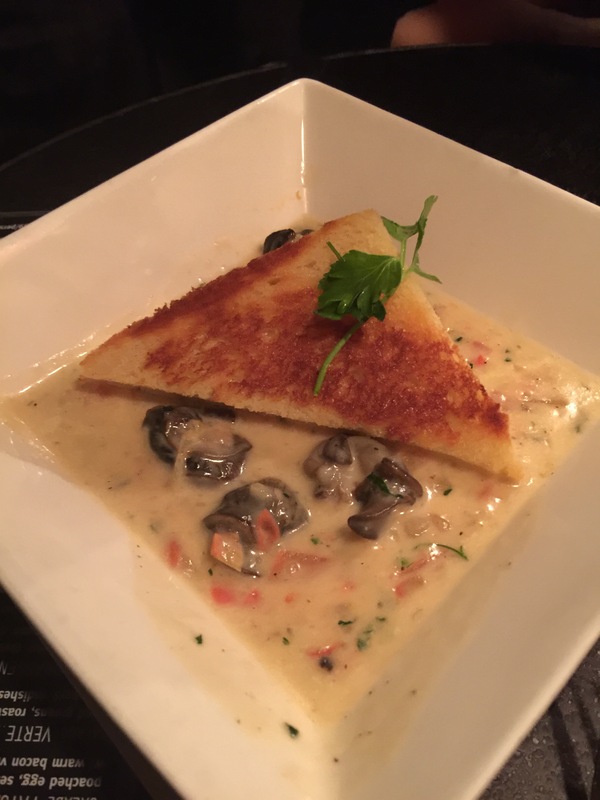 It was so creamy and flavorful, even Emily who doesn’t eat escargot was head-over-heels for it. The scallops were a huge highlight of this meal. 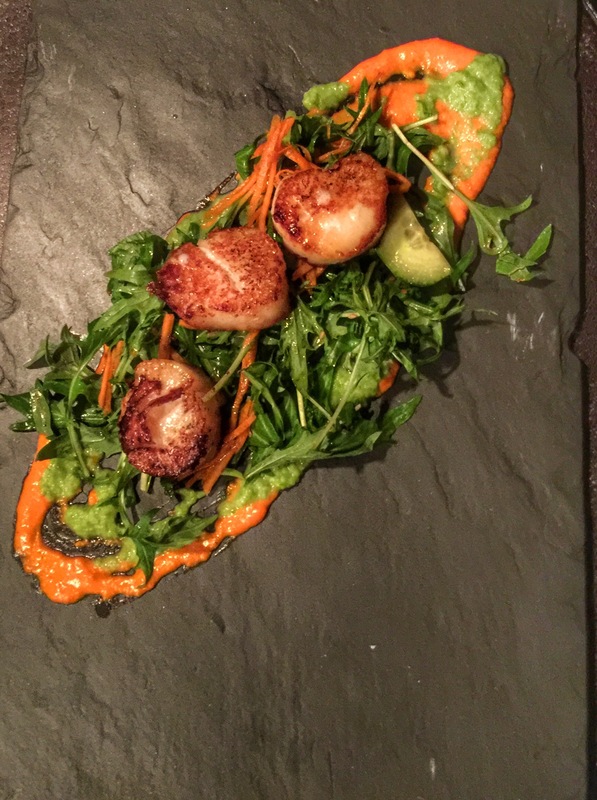 They were seared to a crispy golden brown on both sides and presented on a bed of arugula with a pea puree and romesco sauce. I would go back just for the scallops, they were one of the best things we ate. 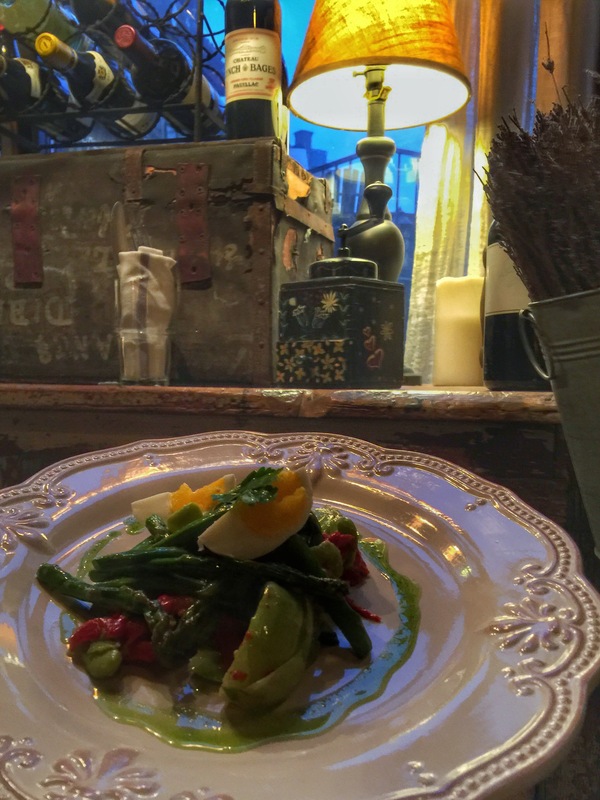 We also shared the asparagus, which was served chilled with pickled peppers, bok choy, a soft boiled egg and a chive vinegrette. It was a fresh and clean dish and was a great side order for the table. Finally, for our last night, we each ended with a Pure Love crepe because they are so amazing. Although we did not make it through the whole menu, we came pretty close. Some other dishes that we wish we had tried and can confidently recommend based on our experience and watching the preparation are:?the honey glazed duck breast, lamb cannelloni, black truffle cheese fondue, and the big apple crepe. We can’t wait to return to aspen not only for the incredible skiing, but also to be back at this wonderful Creperie. 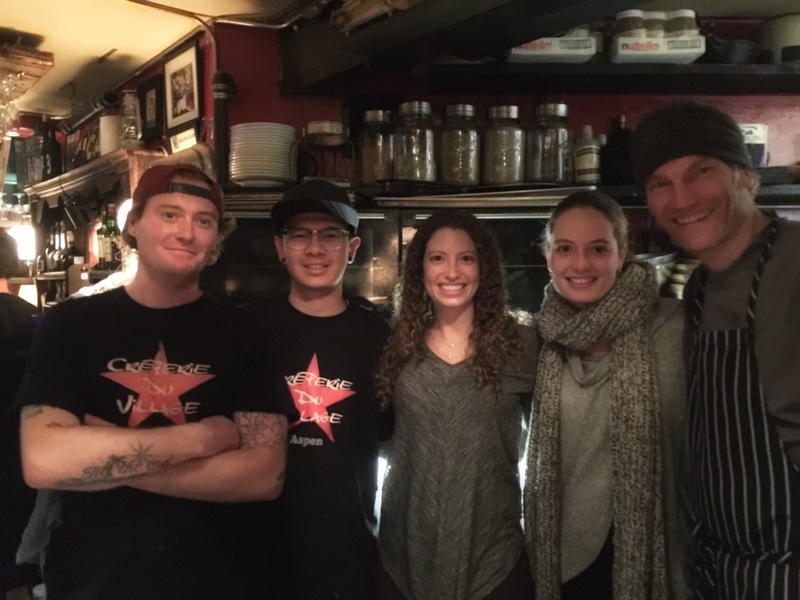 The staff, in and out of the kitchen, are incredible and made us feel at home. The food is unbeatable, especially for the area. This is one of the do-not-miss places on our list of restaurants in Aspen. We want to thank the staff and management for such a positive experience and look forward to visiting again!